Future proofed’ is a good way to describe the new generation Mercedes-Benz Sprinter vans. It’s much more than a load carrier, as the new range (which extends to 1,700 variants) is packed full of functionality and connectivity. Every feature is developed to ensure operators gain efficiencies and help reduce total cost of ownership. The ‘WiFi on-board’ sticker can also be applied. A significant addition to the new range is the installation of the MBUX (Mercedes-Benz User Experience) multimedia connectivity package as recently introduced on Mercedes’ latest passenger cars. Also featuring is the Mercedes PRO fleet management system. The introduction of a new 3.0 litre V6 190 hp diesel, together with upgrades to the 6-speed manual gearbox and the development of a new 9-speed automatic transmission, is also noteworthy, while front wheel drive is being offered for the first time. This new gearbox is primarily aimed at the e-commerce courier business and campervan markets. 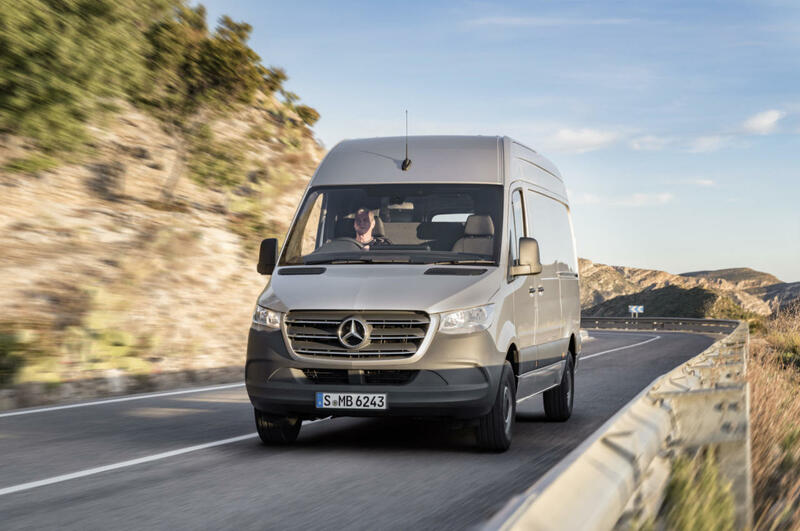 New Sprinter plans to build on the success of the previous generations. Remarkably over 3.4 million units have been sold in every major market across the globe. Interestingly, 60% of all Sprinters sold are fitted out or converted by a specialist body builder. 220,000 units were delivered to customers last year. During the development process, pre- production tests were undertaken in eight locations across four countries, taking in high and low temperatures as well as high altitude, covering over nine million kilometres in the process. What has resulted is a superbly refined drive as exclusively experienced on a scheduled return route from Amsterdam to Rotterdam. To say that the newly designed interior is a revelation is an understatement. From the spot-on seating position to the conveniently laid out interactive control area on the dash, the new layout is miles apart from the pretty staid flat console on the outgoing model. Buyers have a choice of specifying a 10.5” or 7” infotainment touch screen system. The MBUX system, a two-year development project in collaboration with the car division is as simple to use as an I-Pad, with speech control elements added for additional safety and convenience. On the Sat-Nav there is an intriguing aspect with the integration of a fast finding address module courtesy of new start-up company ‘what3words’. through its App, an address can be broken down to three words for quicker download and access. Land Rover and the Red Cross use this service on an ongoing basis. 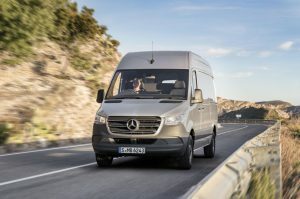 During the day-long drives, three versions of the new Sprinter were trialled – a 3.5 tonne 316 CDI RWD dropside, 314 CDI panel van with RWD, and a 314 CDI FWD 6-seat crew cab. On the 163 hp 316 CDI dropside, the 7G-Tronic Plus auto transmission worked a treat, moving through each gear effortlessly. Steering feel was very positive and all-round visibility is excellent. Interaction with the 10.5” screen was undertaken effortlessly and without much distraction. The more basic 3.5 tonne panel van with similar 2.1 litre block had the new 6-speed manual with the 7” touch screen display, while the 314 CDI 7G-Tronic was impressive. Noticeable on this FWD model is that the load sill and entry step is 80 mm lower than the standard RWD type and offers 50 kg more payload.